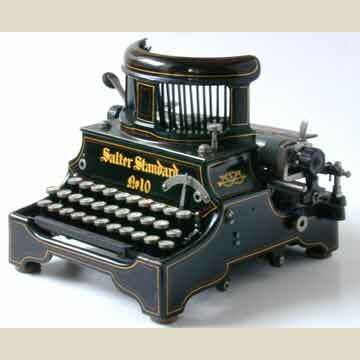 The Salter 10 was the last in the series of downstrike Salter typewriters that had started 16 years earlier, in 1892, with the Salter 5. The number 10 was an impressive machine, that was very similar to the Salter 7 that had appeared only a year earlier. The serial number of this machine indicates how limited the production of the Salter typewriter must have been over the years. 19,000 machines in 16 years would suggest that the Salter company was a workshop rather than a factory. For further details on the Salter see the book â€œTypewriterâ€� page 128.